Due to the popularity of the Lord of the Rings trilogy New Zealand is suddenly on the map of every tourist, adventurer, and student in the world. Frankly, those who have been there will tell you, its about time. New Zealand is home to one of the most beautiful natural environments in the entire world; the people are famous for their kindness and willingness to accommodate all kinds of visitors; and its relative geographic isolation has allowed it to avoid many of the problems faced by other nations today. Aside from the cultural activities, there are also a wide range of outdoor and athletic ones in which both tourists and locals engage. From winter sports like skiing and snowboarding in Mt. Ruapehu, Mt. 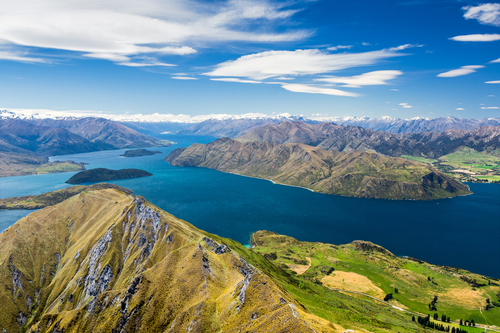 Hutt, Mackenzie Ski Area, Queenstown, and Lake Wanaka, to warm-weather activities like golf, kayaking, and cricket, New Zealand is a paradise for lovers of physical activity and the outdoors. It is, however, with rugby that the kiwis most famously identify. 'Rugby union is closely linked to New Zealand's national identity. The national rugby team, the All Blacks, has the best winning record of any national team in the world, including being the inaugural winner of the World Cup, in 1987.' Its no wonder that they've been so successful: Before every match, the team performs the Haka, a Maori dance-chant that is intended to intimidate the opposing team and ensure victory. It involves 'pukana (dilating of the eyes), whetero (protruding of the tongue performed by men only), [and] ngangahu (similar to pukana, [and traditionally] performed by both sexes)…These expressions are used at various times in the performance to lend meaning and force to the words.' It is a truly terrifying display, and one that has obviously worked quite well for the All Blacks. New Zealand's biggest city is Auckland. Around 1.3 million people live there; 'one third of the country's entire population.' It is a bustling city famous for its beautiful harbor, excellent cafés and nightlife, and many professional opportunities. The quality of life enjoyed by its residents is famously high, and this attracts many students from all over the world. The University of Auckland is part of the University of New Zealand system, and offers classes that run the gamut from art to optometry to law and cover seemingly everything in between. So despite its distance from the United States, spending some of your college years in New Zealand is sure to reward the effort. From the high quality of the education to the beauty of the natural surroundings, this is a wonderful place in which to live and learn. It also combines the advantages of almost ideal size for a university with a superb location in the country's political, commercial and cultural capital. Study with API at one of New Zealand's top universities in the most populous city - Auckland. University of Auckland is ready to welcome international students to its wide variety of course offerings and vibrant campus community. Enjoy life in beautiful Wellington, New Zealand. Join us this fall as we explore the isolated and fascinating islands of New Zealand. With an array of diverse ecosystems, an incredible number of species found nowhere else on Earth,New Zealand provides an excellent setting for our ecological field study. This objective of this programme is to develop advanced professional health sector managers to effectively initiate and manage high quality health programmes, projects and organisations. Spend five weeks in Melbourne, Australia and then five weeks in Auckland, New Zealand while earning 15 college credits. Take courses in Australian/New Zealand Life and Culture, Biology and History. Study Abroad, Languages, Au Pair, Highschool and more! Studying abroad in one of the friendliest and most welcoming nations in the world: New Zealand. Explore the island's world-renowned scenic beauty while enhancing your global understanding in a multicultural and multilinguistic study community.